The other day Rob and I were doing our shopping when I pushed the cart into the home section, essentially pulling Mr. Rob along with me. It’s not like he’s going to see a throw pillow and swoon and say, “ooh, can we keep it?” like I probably will. He might, however, wind up throwing some kitchen whosits and whatsits that we will only use once, if we ever actually use it at all. On this day they were moving out the throw blankets and other winter-y items in favor of a Valentine’s Day section and I was elated. 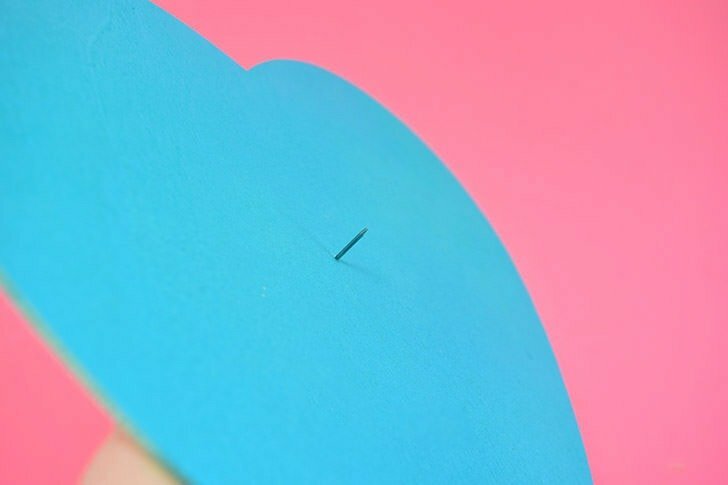 Even though I don’t have kids and I don’t need to buy paper Valentines anymore I still peruse the Valentine’s Day section, deciding which pre-made little paper cards I would pick out if I had any reason to. Ever getting nearer to 40 that seems like such a silly thing but it makes me happy so whatevs :) And on this perusal of all things lovey dovey Rob and I came upon a stuffed caterpillar that was, no joke, probably 8 feet long. Now when I was very, very little my Mimmie would take me to the store and have me buy my own presents but she always played it off like we were buying it for somebody else. I was just doing her a huge favor in picking it out for her because darn if she knew what a little kid approximately my age would like. :) Before I figured her out I’d pore through the toy aisles looking for a very special gift to give some little girl cousin I had somewhere but, for some odd reason had never met, until I found just the perfect item. On one trip I found this gigantic stuffed caterpillar. It was all sorts of lovely bright colors. Yellow and pink and purple little body sections with legs poking off (with sneakers on their feet, can you imagine?!?) made this super cute plushy probably 3 feet long, a far cry from the 8 feet of buggy love we saw recently, but huge to me at the time all the same. I picked out that caterpillar feeling sad that somebody else would get to play with her and then, one day, when I unwrapped a gift, she was in there. Amazing! 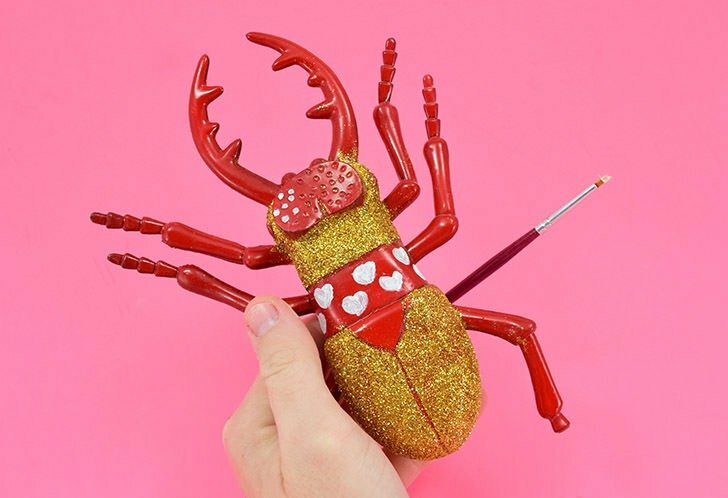 I LOVED that stuffed caterpillar so much and it’s a shame that I don’t have her today, but seeing that big bug in the Valentine’s Day aisle at the store gave me such a lovely trip down memory lane. And my dear Mr. Rob was so sweet that he listened to me talk about a stuffed animal I had ages ago as we continued on our way tossing mostly things we need into our cart! 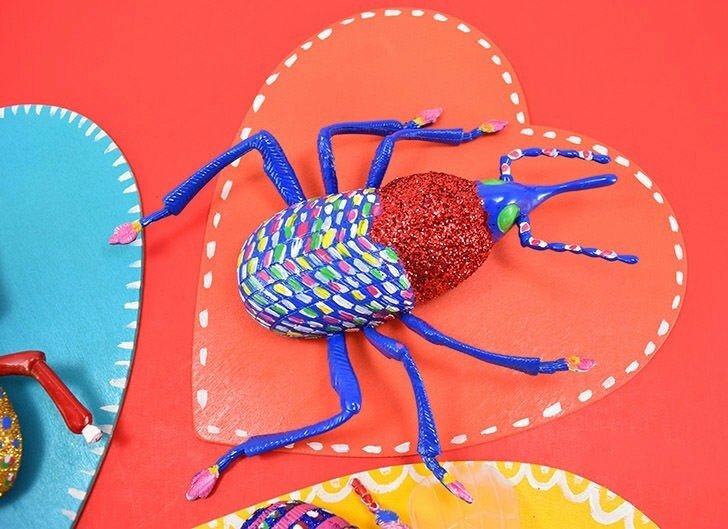 That big ol’ caterpillar made me think of the whole “love bug” thing and I decided to take a big insect toy and turn it into a big bug toy SLASH plaque SLASH wall art SLASH trophy for Valentine’s Day. And it not only looks cool, but these bugs come off of their pedestals for play. 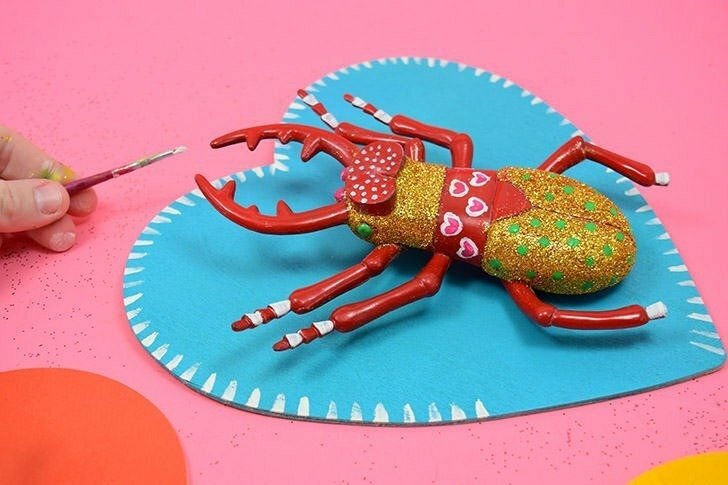 AND you can set business up so that kids can DIY up their own blinged out bug for a fun Valentine’s Day activity. Want the how to? 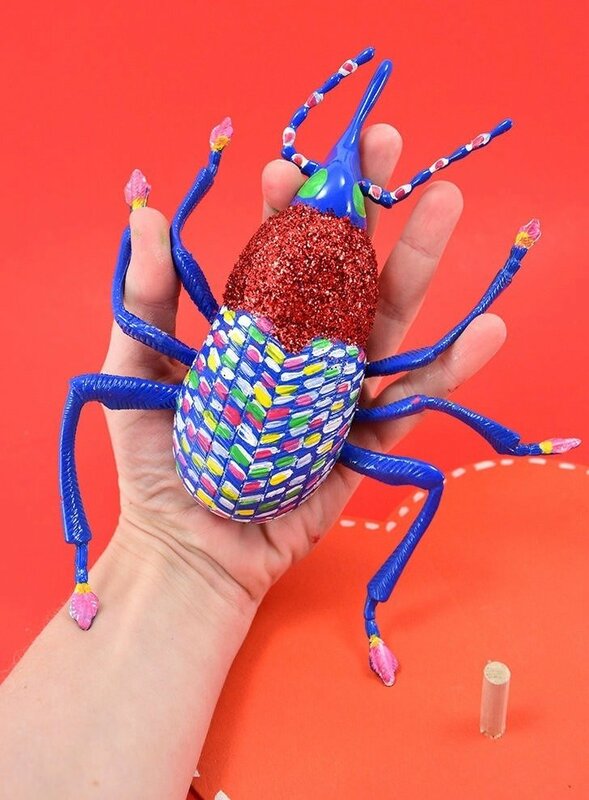 For this project you’re going to need some giant bug toys and luckily I found some on Amazon. These guys are around 8″ with the bee being the smallest in the bunch. There are 5 to a set including a fly which I didn’t really like but, hey, kids like all sorts of stuff, right? 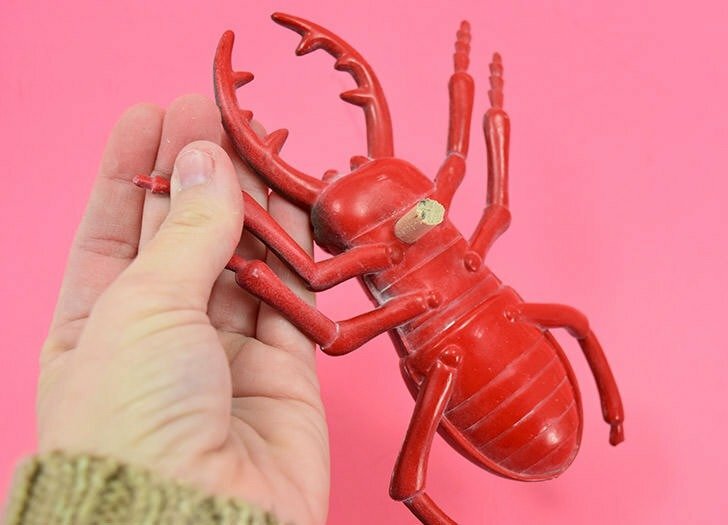 Out of all of the toy bugs I found these are my favorite and make a really big toy to play with. In order to get our paint and glue to stick to the bugs well you’ll need to start with a base coat of spray paint. Remove the wings on your bee, but otherwise you don’t have much prep work to do to get painting. Flat paint would be good but use what you have on hand. Even though it’s Valentine’s Day feel free to use the colors you know the littles in your life would like. 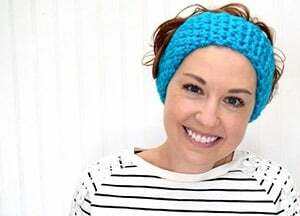 Crazy about blue? Go for it. Valentine’s Day doesn’t have to be all red and white and pink and since we are setting this guy up on a heart plaque it’s still holiday themed. And, by the by, if you’re doing this just because you can purchase a wood piece that is circular or square or whatever instead of a heart. 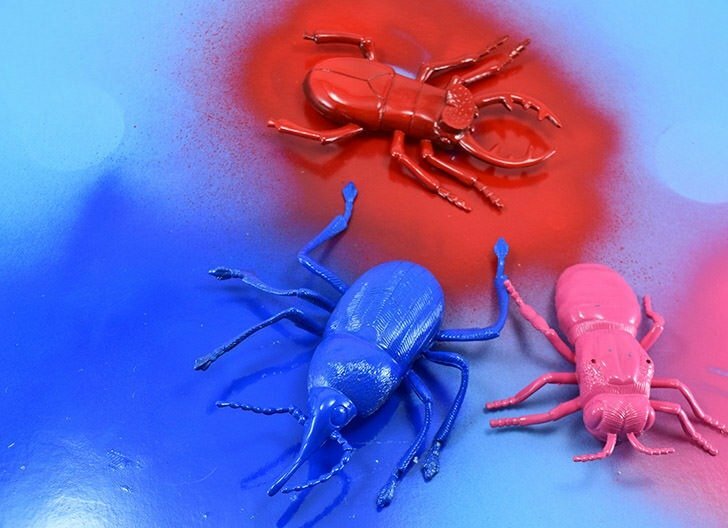 Be sure to give your bugs plenty of time for the paint to dry. Also spray paint your wood plaques a variety of fun colors. 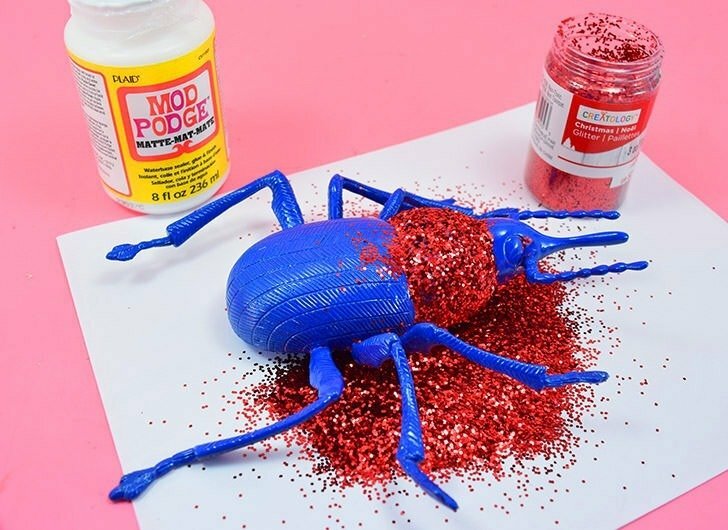 Now this is how these guys are going to work… you’ll have your decorated bug with a hole underneath. The bug will affix to your plaque onto a wooden dowel peg. This set up can be set on a table top or hung on a wall. 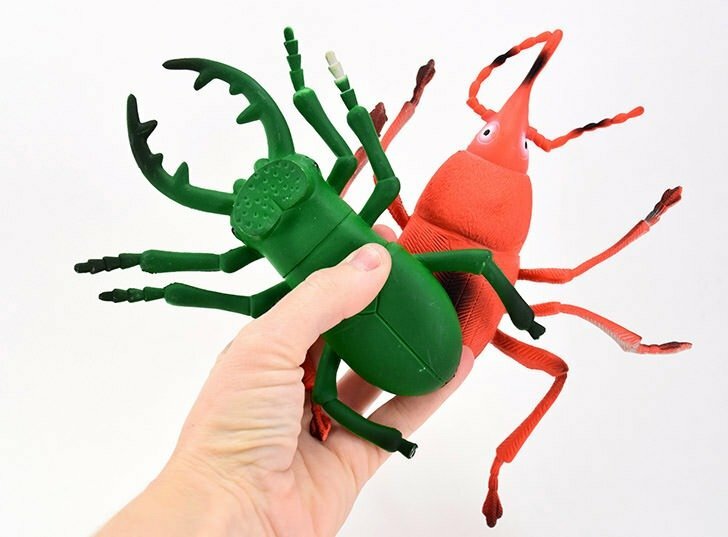 You just place the hole of the bug onto the dowel and easily remove it when it’s time to play. 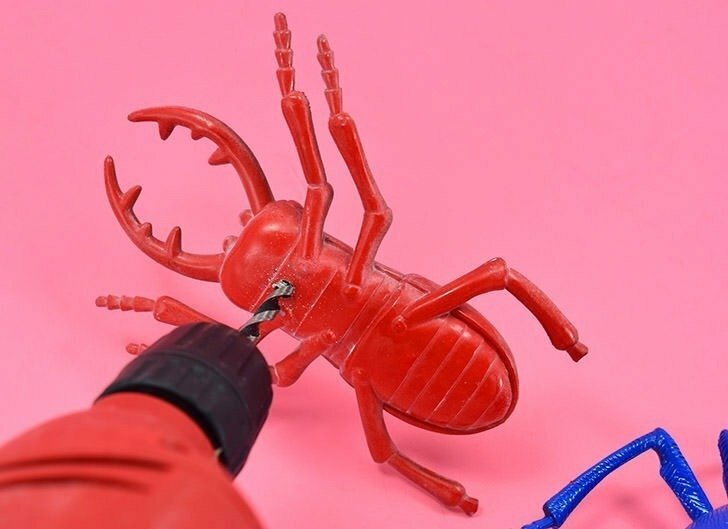 Drill a hole in the underside of your toy bugs that is just the tiniest bit wider than your wood dowel. 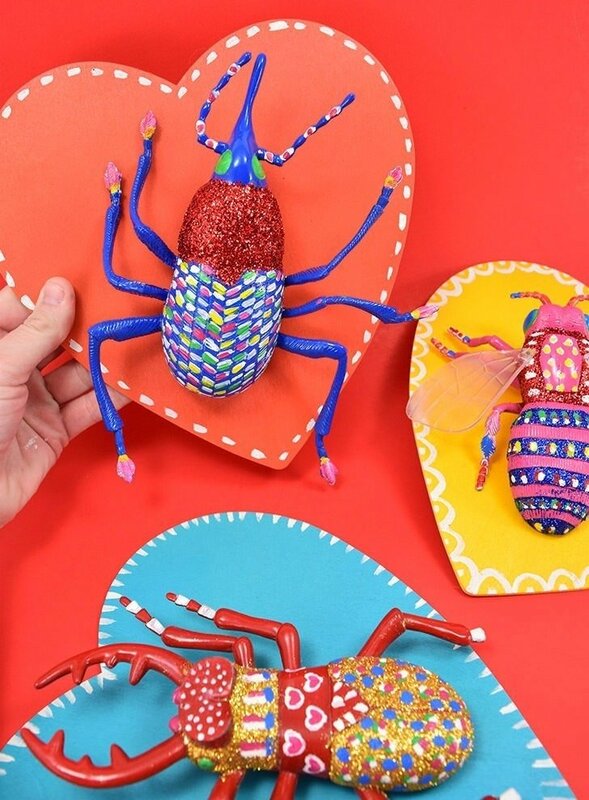 Place your bug onto a painted wooden plaque, arranged as you’d like it to be, and eyeball where the hole meets with wood. Cut a wood dowel 1-2 inches in length, one piece per insect. Test the dowel in the drilled hold of your insect. You want a snug fit (so it doesn’t fall off) but it needs to be slightly loose so that the bug can easily be returned to its plaque. 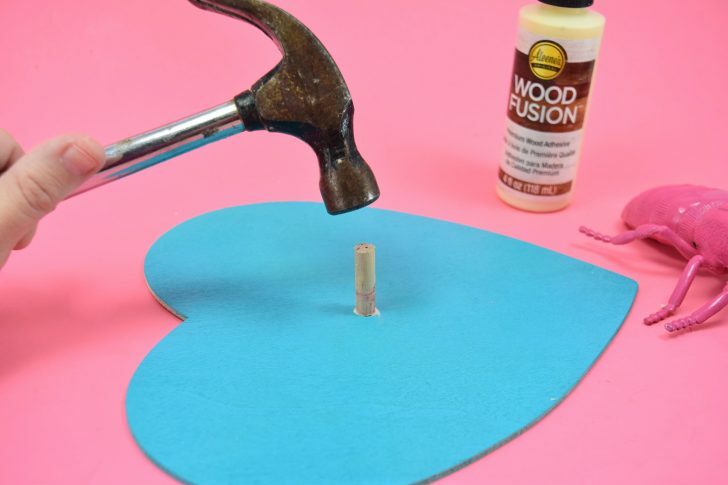 If your hole is slightly too tight, you can twist the drill around in the hole as it turns (slowly to be safe) to rout out the hole and make it a bit bigger. At that point you marked, go through the backside of the wood with a tiny nail. I used tiny wire nails from my stash. Use what you have on hand (screws could work, too). 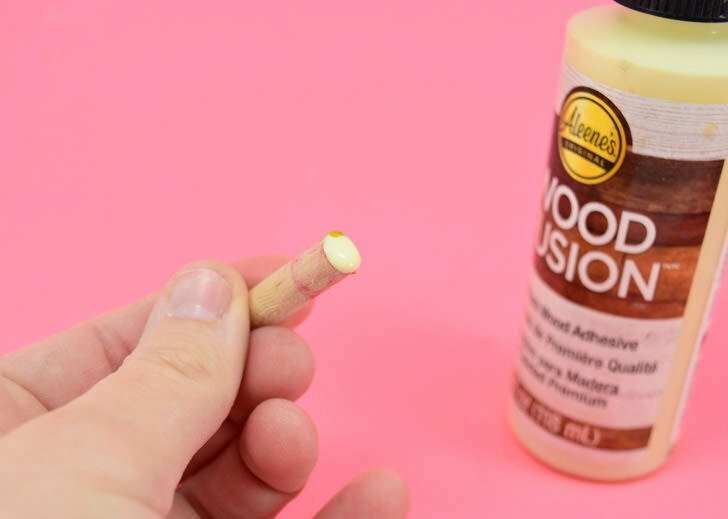 Apply a small amount of glue to the end of your cut wooden dowel that will meet up with the wood. Hammer the dowel on top of the nail keeping the wood as straight as possible to prevent piercing the outer side of the wood. 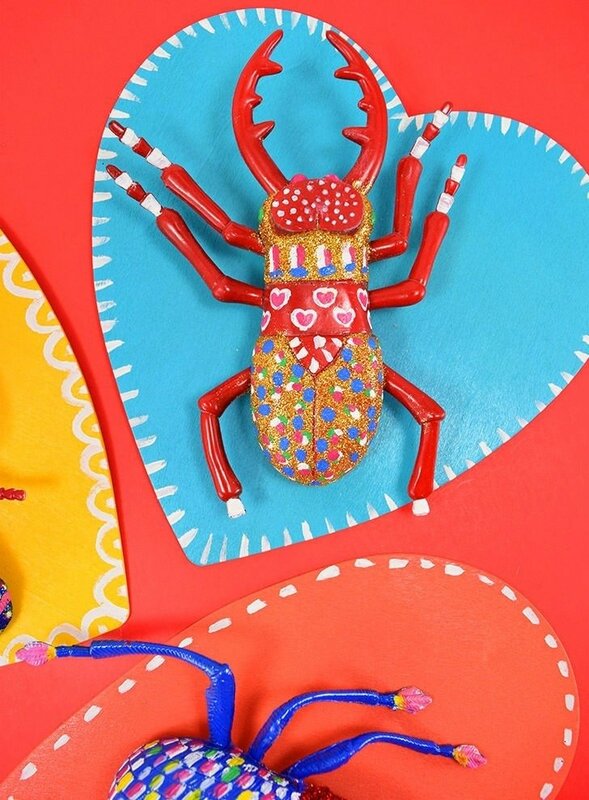 This completes the set up for each love bug toy plaque. 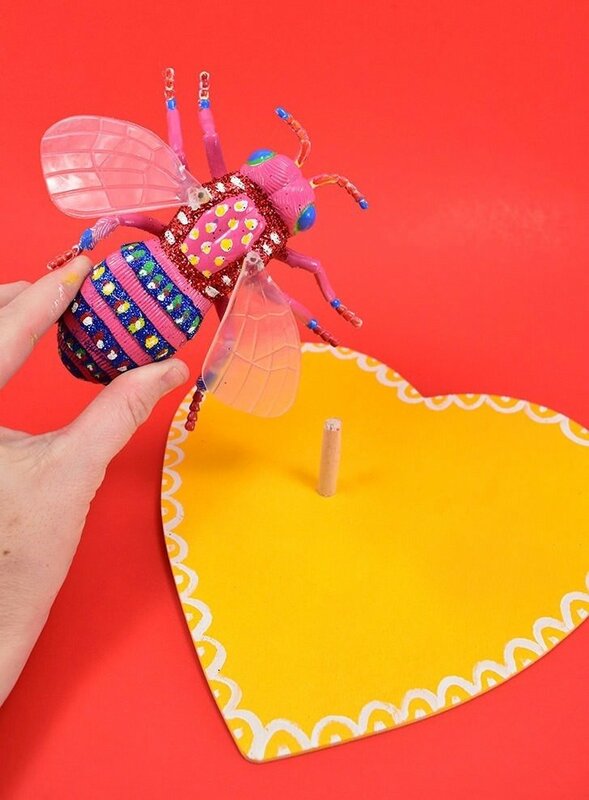 This work can be done in preparation of a party so that each kiddo can decorate their own gigantic love bug. 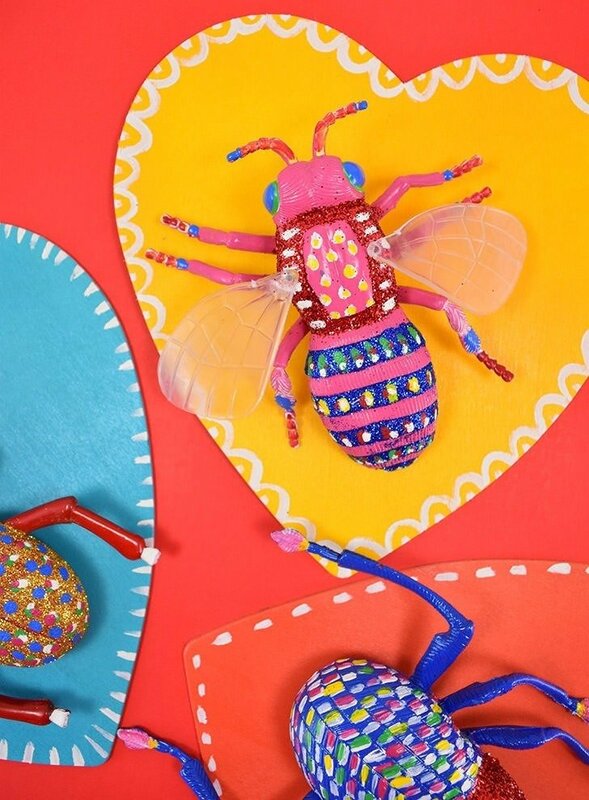 To decorate the bugs grab the glue and glitter, rhinestone and embellish to your heart’s content. Paint works really well, too. And don’t forget the wood plaques can be decorated, too. …waiting until it’s play time. 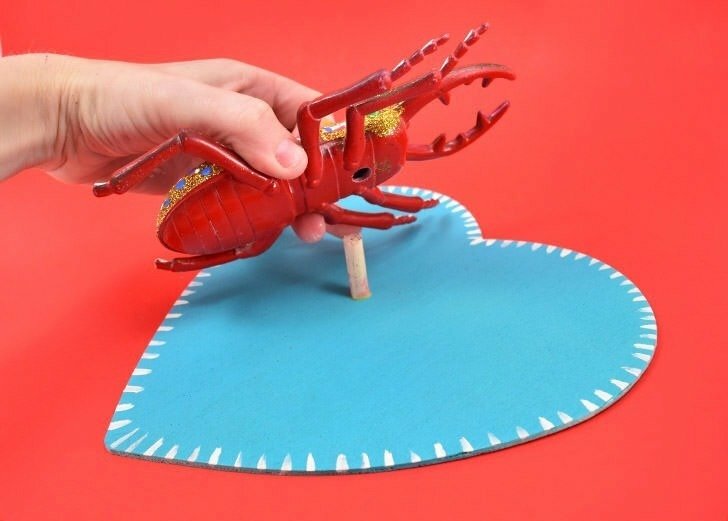 They can sit on a tabletop, or add a hanger to the back so it’s a toy/Valentine’s Day gift/fun craft/wall decor combo thingamajiggie. Oh, and be sure to give the bee its wings back! Yay! 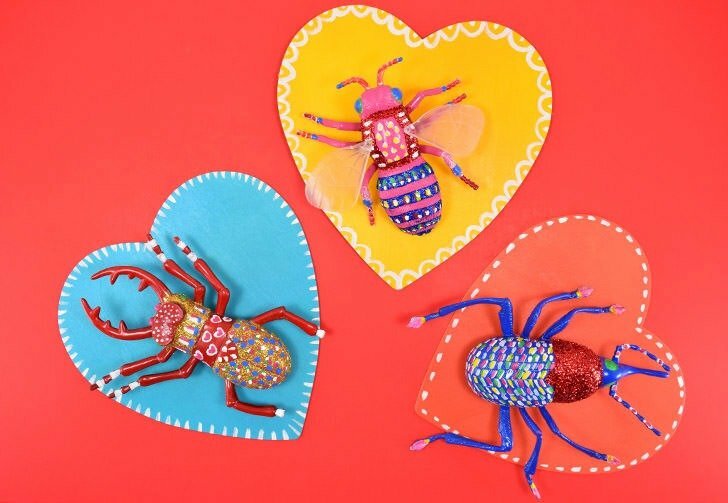 Now isn’t this such a fun, colorful and clever Valentine’s Day craft? I just LOVE it! How about you? Love the Holiday of Love? 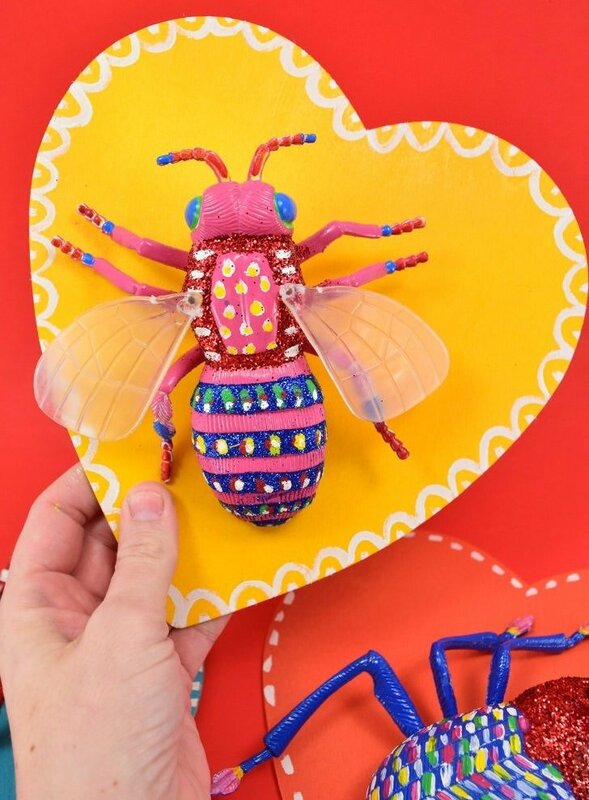 Check out these other Valentine DIYs! Love all this valentine’s day stuff (and spoiling my girlfriends with all the best)! Thank you for the idea!